The upscale Westgate Mall in Nairobi, Kenya, burst into international headlines on Sept. 21, 2013, when unidentified gunmen launched a three-day siege of the shopping center that left at least 67 dead and more than 175 wounded. All attackers were reportedly killed in the mass shooting, later claimed by the Somalia-based Islamist group Al-Shabaab. While people around the world decried the seemingly inexorable spread of terrorism, Kenyans were forced to come to terms with its reality in a new way. During the two years leading up to “Westgate,” they preferred not to acknowledge the threat of fundamentalist forces in the region. When Kenyan troops had invaded neighboring Somalia in October 2011, the public exhibited varied reactions. The process of troop deployment met with little resistance from any of the arms of government. A spate of kidnappings of aid workers on the Kenyan border seemed to add fuel to the fire—though, in truth, the kidnappings may have been carried out by any of the cartels operating from inside Somalia, not necessarily al-Shabaab. It was also often argued that the Kenyan troops were unseasoned and inexperienced, and that the military was eager to demonstrate otherwise. The approval and financial backing of Western allies had added momentum to the operation, which was named “Operation Linda Nchi,” Swahili for “protect the nation.” The official justification was that by invading Somalia we were protecting ourselves. Some believed we had a responsibility to help stabilize our lawless neighbor. Others saw the invasion as a knee-jerk reaction to the kidnapping of a few tourists and foreign aid workers, an event that didn’t deserve a full-scale military assault. Though most Kenyans recognized that we were now “in it,” and there was no turning back, they were slow to grasp the implications. Despite the deadly attacks by al-Shabaab in Kampala the previous year, which killed 74 and injured many others when a bomb went off in the middle of a crowd, few Kenyans anticipated such an eventuality on their soil. The last attack was the deadly 1998 al-Qaida bombing of the U.S. embassy in Nairobi, the worst terrorist attack in our country’s history. It wasn’t that we didn’t know we were in the crosshairs; we just preferred not to speak about it. The war gradually made itself felt in Nairobi. The first wave of terrorist reprisals by al-Shabaab was a series of poorly executed grenade attacks that only killed one or two, but stirred palpable fear. After all, violent attacks once reserved for distant, tiny towns along the Somali border were now happening in the crown jewel of East Africa, the most modern and progressive city on this side of the continent. Still, they were confined to impoverished and marginalized sections of the city—far from the rich and middle-class havens of the “other Nairobi” located west of Moi Avenue, the road cutting across the central business district that has become symbolic of the city’s social divide. East of Moi Avenue is characterized by congestion, dirtier streets and less safe neighborhoods; west of it are tall, modern buildings housing nongovernmental organizations and corporations from all over the world, glamorous night life, manicured lawns and, of course, shopping malls. As the attacks increased over the next year, security measures increased. The guards (“askaris”) who once stood outside the doors of supermarkets and office buildings armed with little more than nightsticks and flashlights, added hand-held metal detectors to their arsenal. These were meant to deter the potential grenade attacker through early detection of the device, should it be hidden in a pocket or a handbag. Each person was to be screened before entering a building. Meanwhile, the attacks were becoming more sophisticated. In one, at a busy section of Moi Avenue, an improvised explosive device went off inside a building that housed a number of stalls where shopkeepers sold clothes and mobile phone handsets. Just one person was killed, but the fact that it had occurred in the heart of the business district—closer to the “other Nairobi” than ever before—set off alarm bells. As reflected in the Kenyan press, only good news came from Somalia: the terrorists had been decimated and were now on the run, reduced from a rebel faction to a mere insurgency, greatly weakened by the overwhelming force of our troops under the banner of the African Union. The reality of how close jihad had come to our doorstep never fully evaporated from the back of our minds. Yet life went on as if none of the attacks had ever happened. It wasn’t that we didn’t know we were in the crosshairs; we just preferred not to speak about it. On the afternoon of Sept. 21, 2013, however, that became impossible. When gunmen entered Westgate Mall brandishing heavy weapons and ammunition strapped across their chests, witnesses are reported to have thought it was an ordinary bank robbery. This idea was shattered when the terrorists began indiscriminately shooting in every direction, killing dozens and leaving dozens more injured in their path. Suddenly, the words “Westgate” and “Nairobi” began trending on Twitter worldwide. Tweets could also be read from desperate survivors trapped inside the mall. Police and ambulance sirens could be heard across the city as emergency services rushed to the scene. The rest of the country watched the events unfold on their TV screens. We had been warned of this day, but it all seemed unreal. We were used to a bomb or a grenade going off and seeing footage of the destruction afterwards. This time live television confronted us with the sounds of sporadic gunfire and victims, journalists, police and emergency medical technicians alike all shouting and ducking for cover. On Sept. 21, 2013, unidentified gunmen entered Westgate Mall in Nairobi. Firing randomly and taking hostages, the terrorists laid siege to the upscale shopping center for three days, leaving at least 67 dead and more than 175 wounded. Above, officers of the Kenyan Defense Forces during a rescue operation on that day. Nairobi’s cosmopolitan nature became evident in news footage showing people of every race and ethnicity running out of the mall. This may be one of the reasons the event drew so much attention from international news agencies: the fact that along with Kenyans, people from their own countries may have been trapped in the mall. Another reason could have been the scene itself. Westgate Mall, in the leafy, upscale suburb of Westlands (west of Moi Avenue, of course), is a popular spot for middle-class and rich Kenyans and also for the expatriate community of journalists, tourists and employees of the United Nations and numerous other international NGOs operating in Nairobi. In many ways, Westgate epitomizes the “other” Nairobi—an oasis of fine dining, coffee houses and world-class shopping, it offered all the excesses of being fortunate enough to be an affluent Nairobian. Few imagined that this would be ground zero for jihad in Kenya. As more news reached the international media, discussion of the devastating event took on an interesting twist. Besides calls for unity and love among Kenyans during this trying time, tweeters from the rest of the world also began expressing their surprise that there were any shopping malls in Kenya. Yet one would think that a city with four million residents, one of the largest stock exchanges in Africa and the headquarters of more than 100 major international companies and organizations, would have at least one shopping mall. Indeed, the curiosity of this apparently “Western” environment seems to have contributed to the massive international news coverage. It struck home for some with familiar overtones of shootings in Aurora and Sandy Hook: senseless violence and young lives snatched away by gunfire. Westgate, however, was not a result of weak gun laws or introverted perpetrators who had slipped through the cracks of society. Our country was under attack. After four days of a horribly botched operation by the Kenyan army to neutralize the attackers came to an end, the effects on our collective psyche were tremendous. Suddenly no one felt safe anymore. Rich, poor, black, white: when jihad came knocking, everyone was a target. There was an enormous outpouring of love and support from Kenyans to all those who had been affected by the attack. People gave blood, food and clothing, anything that would take our minds off the news and counteract our feelings of powerlessness. Something called “the Kenyan Spirit” was seen in the acts of charity and giving. International journalists said that in all their years spent around the world, they had never been served tea and food by well-wishers at the scene of any event they were covering. Everyone acknowledged that this was not a normal occurrence. Kenya is a country where the top 10 percent of the population earns 44 percent of the country’s income. The poverty rate is between 37 and 42 percent, and 40 percent of the working-age population is unemployed. Nowhere in the country are these inequalities more extreme than in the capital, where people from all over the country come in search of a better life. Two-thirds of Nairobians live in “informal settlements,” the shantytowns littered with miles and miles of tin shacks. These informal settlements occupy less than 5 percent of the total landmass. Suddenly no one felt safe anymore. Rich, poor, black, white: when jihad came knocking, everyone was a target. When you hear about Nairobi being one of the top property markets in the world, you probably won’t be told that a majority of these developments cater exclusively to high-income earners, leaving the poor with no chance of ever owning a home. Impressive high-rise apartments overlook slums with some of the lowest living standards in the world. Executives and professionals walk past beggars and street families on their way to work. For us, this is simply how it’s always been. Poverty is like a physical feature: a mountain or a stream or a statue that you see every day, and don’t look at twice because it is a fixture that never changes. Even in an Africa that is finally rising, with a middle class that is expanding, nothing is trickling down to those who have made the unfortunate mistake of being born poor. This, it would seem, is a tragedy much vaster and deeper than Westgate. Yet it isn’t treated with the urgency of a national disaster. Without downplaying the loss of life, I would suggest that the place where Kenyans responded with charity and togetherness is where we ought to go to bridge the gap between east and west of Moi Avenue. Unfortunately, that doesn’t look to be happening any time soon. Recent times have seen more attacks occur in churches and, even more often, against public service vehicles. With increasing public pressure and tourist numbers dwindling due to perennial travel advisories, the government’s remedy has been a police campaign based on racial profiling of Somalis, both Kenyan and refugee. A worrying trend has also been the assassination of radical Muslim clerics in the coastal city of Mombasa, which many claim to be the work of either the police or Kenyan intelligence agencies. A massive investment in the security apparatus has been promised as Kenyans desperately grasp at any sense of normalcy amid all the uncertainty. On the surface, though, nothing seems to have changed since the Westgate attack, and one is left with the sense that there is nothing to stop the next one. Meanwhile, the country continues to endure all the old problems that plagued it before the terror. The only difference is that words like “improvised explosive device” have been added to our vocabulary. Terrorism is not the biggest threat facing Kenya. Perhaps the bigger problem is the complacency of a system that is now failing to combat it. 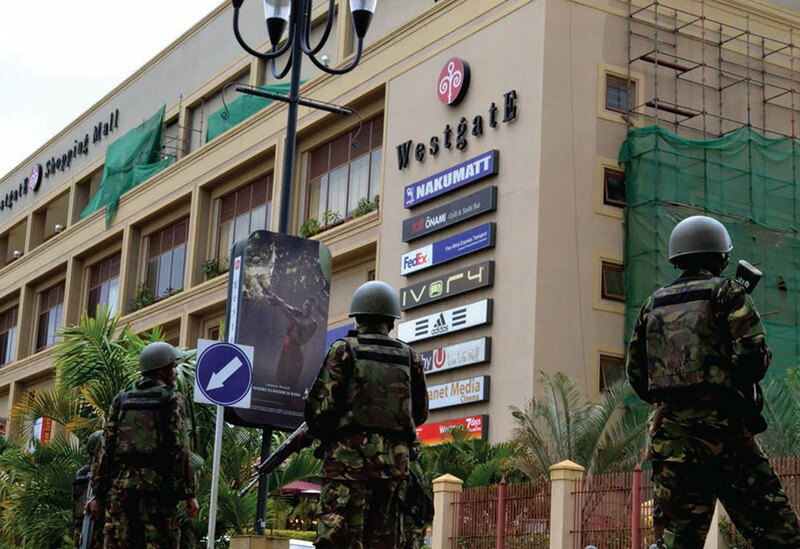 Mobilizing the “Kenyan Spirit” to address terror won’t necessarily head off another Westgate. It may, however, be the wellspring that sets us on the path to positive change. Joash Omondi is a journalism student at the United States International University in Nairobi.